“I love fashion. Its something I’m really passionate about as a means of self-expression – but also creative output”. Dressing individual is the new ‘Fashionable’. 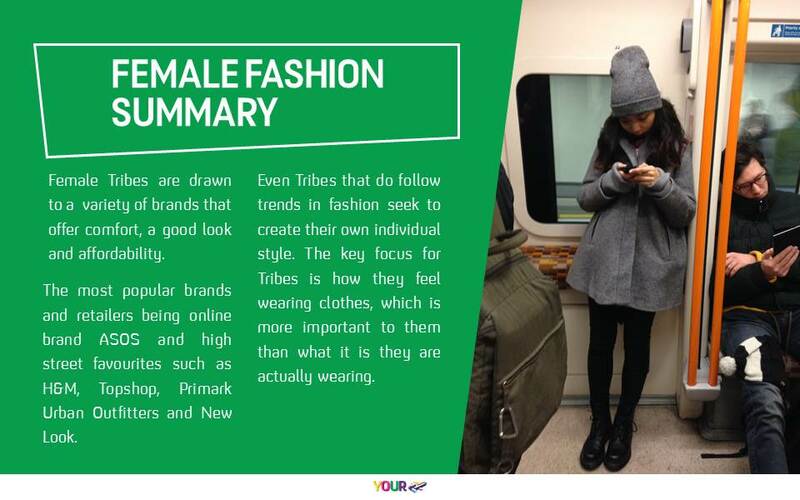 In the main, the Your4 Community were happy to digress from mainstream fashion trends, with their focus being more so on whether they liked the trend. Its important to them that they are comfortable with how they look and not to conform to mainstream trends if they disliked them. Whilst some of The Tribes enjoyed following trends, others stated how it was an expensive hobby to maintain, as a result following trends wasn’t always attainable. Although a minority of Tribes weren’t interested in Fashion, many however, saw fashion as an opportunity to reinforce their identity and self expression. Style is very important to me – but not really fashion so much. I like to know trends and what is going on – but I don’t usually then wear the trends. I will look for trends that I specifically like and I think are worth investing in. 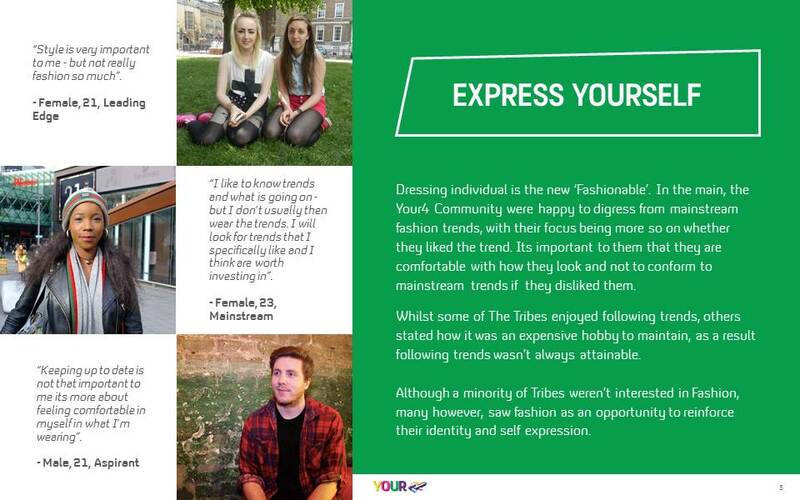 Keeping up to date is not that important to me its more about feeling comfortable in myself in what I’m wearing. 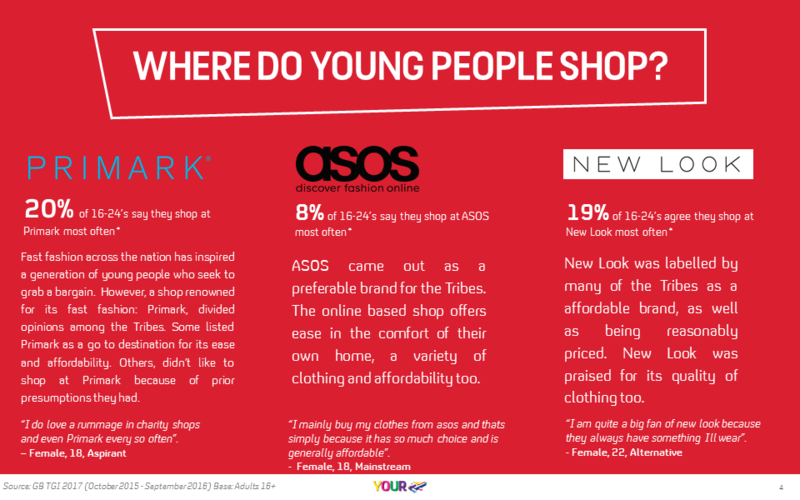 WHERE DO YOUNG PEOPLE SHOP? Fast fashion across the nation has inspired a generation of young people who seek to grab a bargain. However, a shop renowned for its fast fashion: Primark, divided opinions among the Tribes. Some listed Primark as a go to destination for its ease and affordability. Others, didn’t like to shop at Primark because of prior presumptions they had. I do love a rummage in charity shops and even Primark every so often. 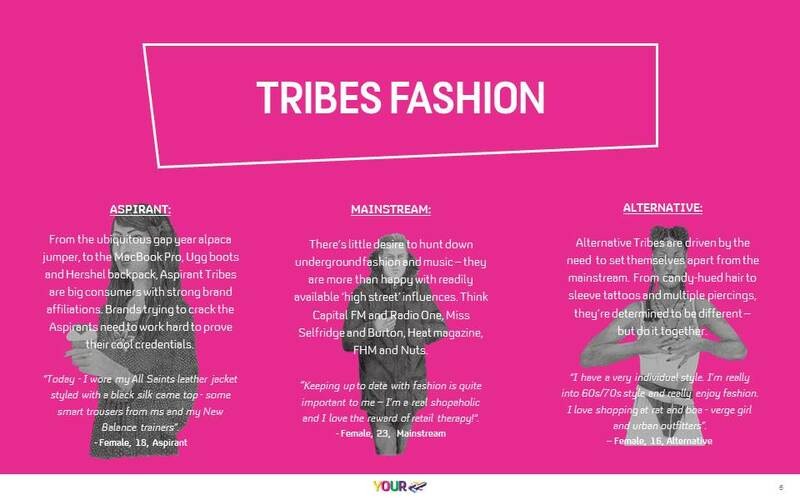 ASOS came out as a preferable brand for the Tribes. The online based shop offers ease in the comfort of their own home, a variety of clothing and affordability too. I mainly buy my clothes from asos and thats simply because it has so much choice and is generally affordable. New Look was labelled by many of the Tribes as a affordable brand, as well as being reasonably priced. New Look was praised for its quality of clothing too. I am quite a big fan of new look because they always have something Ill wear. 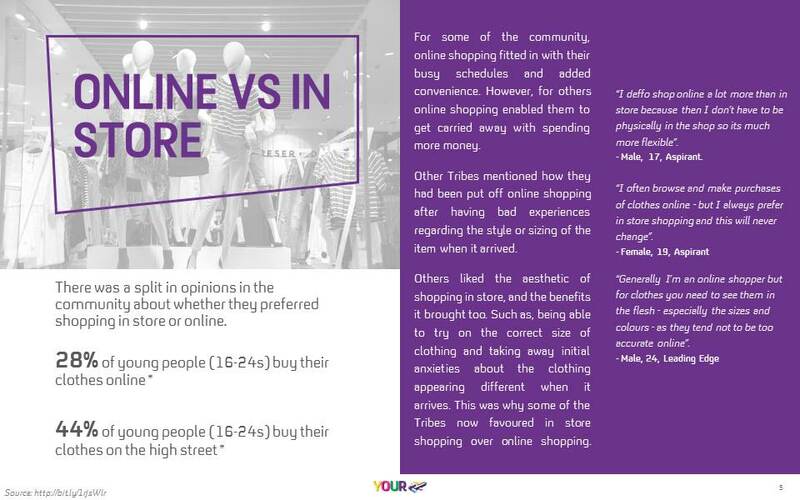 There was a split in opinions in the community about whether they preferred shopping in store or online. For some of the community, online shopping fitted in with their busy schedules and added convenience. However, for others online shopping enabled them to get carried away with spending more money. Other Tribes mentioned how they had been put off online shopping after having bad experiences regarding the style or sizing of the item when it arrived. Others liked the aesthetic of shopping in store, and the benefits it brought too. Such as, being able to try on the correct size of clothing and taking away initial anxieties about the clothing appearing different when it arrives. This was why some of the Tribes now favoured in store shopping over online shopping. I deffo shop online a lot more than in store because then I don’t have to be physically in the shop so its much more flexible. I often browse and make purchases of clothes online – but I always prefer in store shopping and this will never change. Generally I’m an online shopper but for clothes you need to see them in the flesh – especially the sizes and colours – as they tend not to be too accurate online. From the ubiquitous gap year alpaca jumper, to the MacBook Pro, Ugg boots and Hershel backpack, Aspirant Tribes are big consumers with strong brand affiliations. Brands trying to crack the Aspirants need to work hard to prove their cool credentials. Today – I wore my All Saints leather jacket styled with a black silk came top – some smart trousers from ms and my New Balance trainers. There’s little desire to hunt down underground fashion and music – they are more than happy with readily available ‘high street’ influences. Think Capital FM and Radio One, Miss Selfridge and Burton, Heat magazine, FHM and Nuts. Keeping up to date with fashion is quite important to me – I’m a real shopaholic and I love the reward of retail therapy! Alternative Tribes are driven by the need to set themselves apart from the mainstream. From candy-hued hair to sleeve tattoos and multiple piercings, they’re determined to be different – but do it together. I have a very individual style. I’m really into 60s/70s style and really enjoy fashion. I love shopping at rat and boa – verge girl and urban outfitters. Leading Edge Tribes are proactive scene leaders that live for the new and now. These guys collaborate across Tribes, develop contacts, share ideas and set the agenda. To be honest – I don’t really get advice from family or friends anymore about making a new purchase. I generally come across something on Instagram/Buzzfeed/Tumblr/Pinterest and buy it from the manufacturer. Fashion-wise, street wear rules – from classic sports brands to independent urban labels, such as King Apparel. 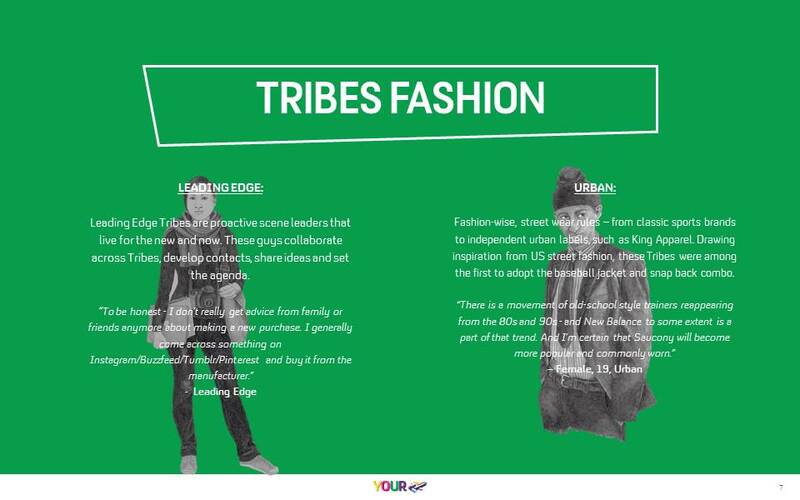 Drawing inspiration from US street fashion, these Tribes were among the first to adopt the baseball jacket and snap back combo. There is a movement of old-school style trainers reappearing from the 80s and 90s – and New Balance to some extent is a part of that trend. And I’m certain that Saucony will become more popular and commonly worn. When it comes to the representation of body image in Fashion many Tribes felt as though there was a glass ceiling to break into or be accepted in the fashion industry. 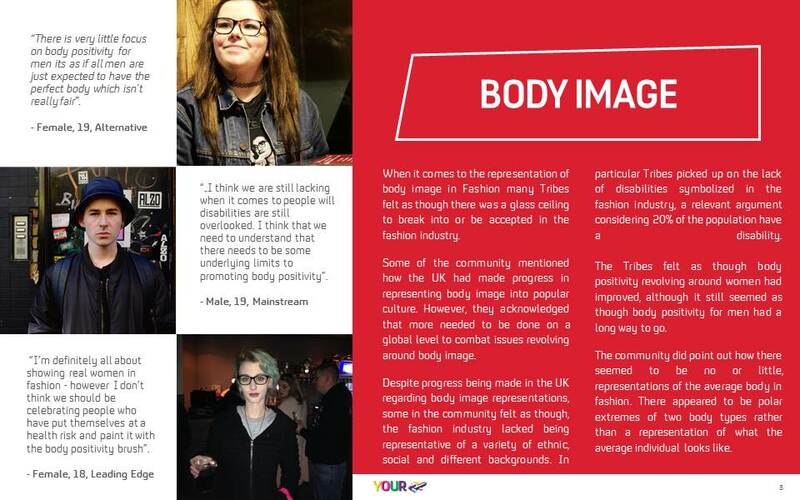 Some of the community mentioned how the UK had made progress in representing body image into popular culture. However, they acknowledged that more needed to be done on a global level to combat issues revolving around body image. Despite progress being made in the UK regarding body image representations, some in the community felt as though, the fashion industry lacked being representative of a variety of ethnic, social and different backgrounds. In particular Tribes picked up on the lack of disabilities symbolized in the fashion industry, a relevant argument considering 20% of the population have a disability. The Tribes felt as though body positivity revolving around women had improved, although it still seemed as though body positivity for men had a long way to go. The community did point out how there seemed to be no or little, representations of the average body in fashion. There appeared to be polar extremes of two body types rather than a representation of what the average individual looks like. There is very little focus on body positivity for men its as if all men are just expected to have the perfect body which isn’t really fair. …I think we are still lacking when it comes to people will disabilities are still overlooked. I think that we need to understand that there needs to be some underlying limits to promoting body positivity. I’m definitely all about showing real women in fashion – however I don’t think we should be celebrating people who have put themselves at a health risk and paint it with the body positivity brush. 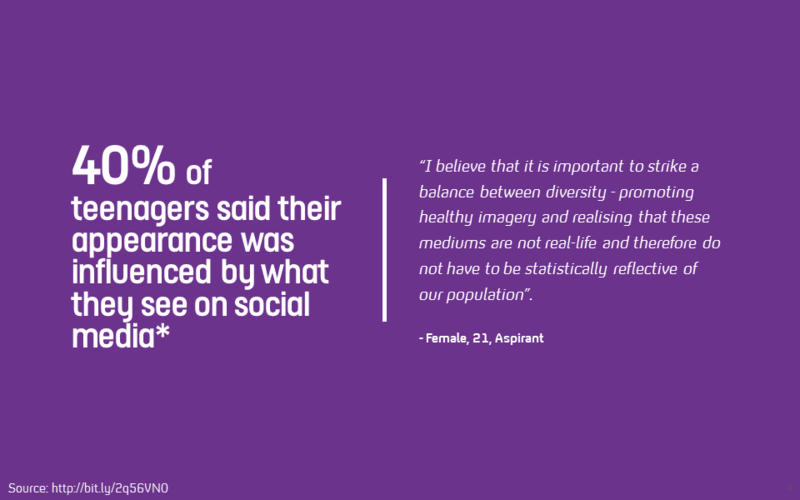 I believe that it is important to strike a balance between diversity – promoting healthy imagery and realising that these mediums are not real-life and therefore do not have to be statistically reflective of our population. For many of the Tribes, spending money on clothes is a popular pastime, however, money could often be a deal breaker when they were purchasing clothing items. As a result, the expenditure influenced the style of clothing that some of the community decided to purchase and even sometimes their dress sense. 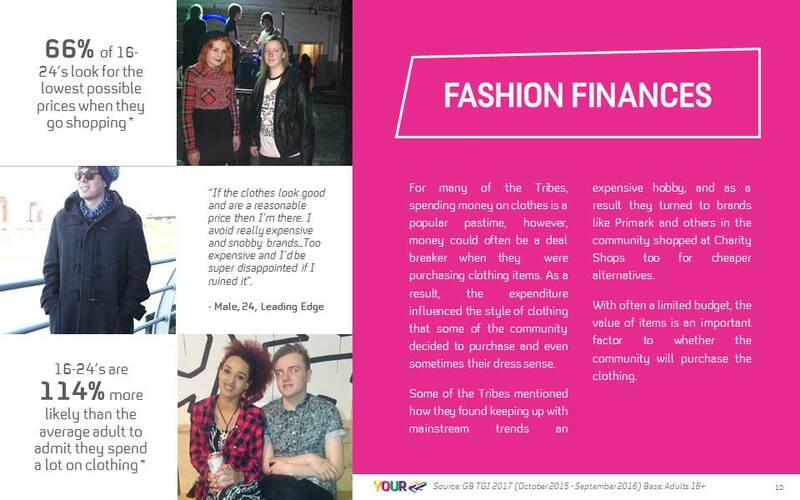 Some of the Tribes mentioned how they found keeping up with mainstream trends an expensive hobby, and as a result they turned to brands like Primark and others in the community shopped at Charity Shops too for cheaper alternatives. With often a limited budget, the value of items is an important factor to whether the community will purchase the clothing. If the clothes look good and are a reasonable price then I’m there. I avoid really expensive and snobby brands…Too expensive and I’d be super disappointed if I ruined it. Female Tribes are drawn to a variety of brands that offer comfort, a good look and affordability. The most popular brands and retailers being online brand ASOS and high street favourites such as H&M, Topshop, Primark Urban Outfitters and New Look. Even Tribes that do follow trends in fashion seek to create their own individual style. The key focus for Tribes is how they feel wearing clothes, which is more important to them than what it is they are actually wearing. Male Tribes seem to go for causal/everyday looks, such as a pair of jeans and a t-shirt. However, they still like to add their own personal touch by styling these essentials with jackets and accessories in order to keep their individuality. 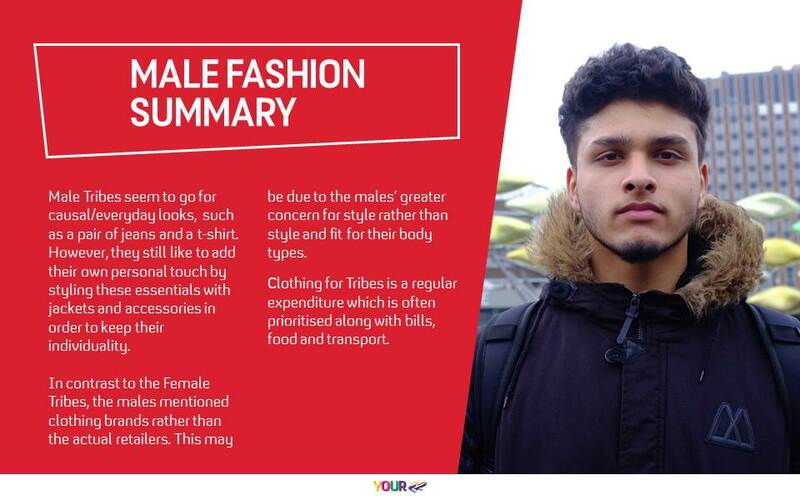 In contrast to the Female Tribes, the males mentioned clothing brands rather than the actual retailers. This may be due to the males’ greater concern for style rather than style and fit for their body types. Clothing for Tribes is a regular expenditure which is often prioritised along with bills, food and transport. For young people, fashion is about self expression and wearing what makes them feel good rather than complying to the latest trends. Being an individual has become the new mainstream. There is a sense of fluidity in how young people dress, despite the fact that fast fashion is readily available, these styles will be interpreted differently by the contrasting cultural segments. 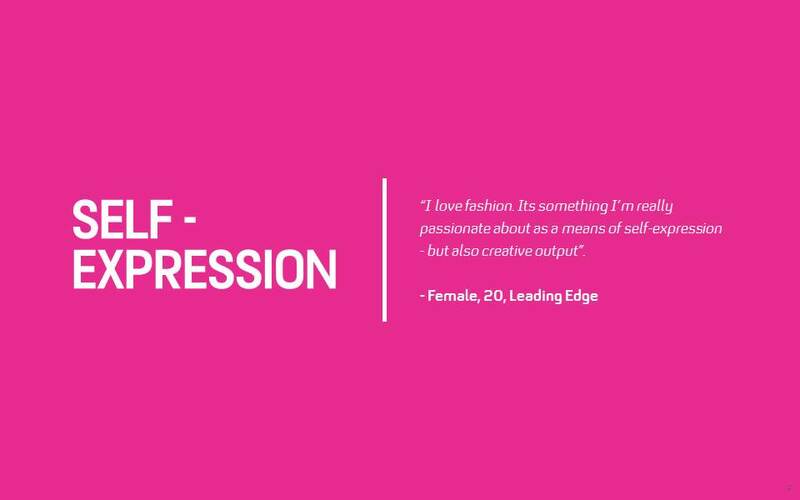 Body image is an important contributor to how young people not only view themselves but the fashion industry too. The Tribes felt as though more needs to be done to address body image issues on a global level. The Tribes acknowledged wider issues revolving around body image too. They noticed how important it was for the fashion industry to showcase more realism in the average sized body types. They also commented on the underrepresentation of those with disabilities in fashion industries. Map Your Apps Is Back! Our tribes’ social universe As the apps market continues to become more saturated, it’s clear that Tribes are co...	Read more about Map Your Apps Is Back!